Mobile phones are a sort of roach motel for data: Your phone book, SMS messages, and other information checks in, but it's extremely hard to get it to check out again. That's the strength of BlueSoleil ($30, 30-day free trial with feature limitations), which can provide you with a valuable ability to synchronize data between phones and Windows PCs, using the Bluetooth radio that's built into virtually every modern cellphone and most laptop computers. So long as you can establish a Bluetooth connection between your Java- or Symbian-based mobile phone and a Windows XP or Vista computer (sorry, Windows 7 users, but that OS isn't yet supported), you can perform up to 18 different data management functions over the wireless connection. BlueSoleil may be able to use any of a number of data functions on your Bluetooth-enabled phone...but you'll have to install the trial to find out. BlueSoleil is a commercial product, but the company gives you a 30-day trial to see what the program is capable of doing. The trial version is limited to transferring no more than 2MB of files or data from the phone to the PC, but that's typically more than enough to sync a phone book or download your SMS text message logs from the phone, two features that most people will want to try. Because mobile phones are such an insular and inscrutable computing environment, the capabilities of the program to manage as many as 13 different features (which the program calls "services") on your particular model of mobile phone isn't easy to predict. Certain phones are capable of only carrying out certain kinds of data operations. Unfortunately, the only way to find out which ones your phone can handle is to test out the software; fortunately, the vendor offers a free trial. 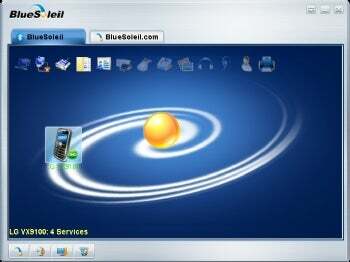 BlueSoleil can also use your mobile phone as a wireless data modem for the laptop computer if the phone supports that feature, for instance. You can also use the software to transfer files, such as cameraphone videos or photos, or ringtone MIDI files, between the phone and the laptop; to print or fax documents from the phone; to connect directly to the phone's microphone and speaker connection, and to make calls using the laptop to dial. It can also helptake photos from the phone's camera, or send SMS text messages; or even to make a voice-over-IP call on the telephone using the laptop's broadband connection. But each of these abilities depends on whether the software can control various aspects of your phone, so a trial run is a must. Initial setup can be challenging, but no more so than it typically is with any Bluetooth connection. The software probes for discoverable devices for only a few minutes, and you're required to enter a security code on both ends--on the phone and laptop--before the program will tie the two devices together. Once you're in business, you'll be able to back up your phone's contacts and data, smartphone-style, as if it were physically connected to the laptop. For most people, that alone would be worth the price. The rest of BlueSoleil's features are just gravy.